PULP FICTION, 1994. Original US 1 sheet (27″/40″) Quentin Tarantino unfolded single sided movie poster authentication tips and poster for sale here. This movie was starring; John Travolta, Uma Thurman, Samuel L. Jackson and was written and directed by Quentin Tarantino. This is Tarantino’s 2nd film and really solidified his career as a reinvigorator of the classic grind house and cult genre (to see an original poster for his 1st film Reservoir Dogs follow the link). A master at popularizing a genre that was never meant to be popular, Tarantino is perhaps best known for his fantastic dialog and elaborate use of gore. and, To good to be true deals. f you have any questions about movie poster authentication just <Contact Us>! 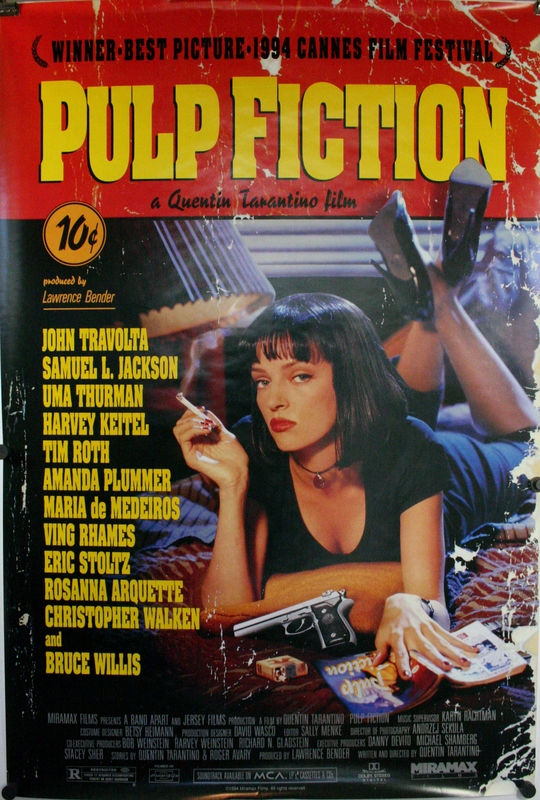 This poster is guaranteed a 100% authentic original 27/40″ theatrical release poster for Pulp Fiction. This particular Tarantino movie theater poster for sale is in near mint condition and does not have any major imperfections and only one minor imperfection to note. There is slight bending and ruffling on the margin along the bottom vertical and bottom horizontal margin. Outside of this the poster is in mint condition. Condition C9. Sold For $275. <Click Here> for another copy of this poster!